Hon. David Jones, British MP, Welsh Secretary in David Cameron’s government, and Minister of State for negotiations with the European Union in Theresa May’s cabinet met with Maryam Rajavi, the leader of Iran opposition in the MEK’s settlement in Albania (Ashraf III), on Saturday, 6 April 2019A senior member of parliament (MP) from the United Kingdom met with the president-elect of the Iranian opposition, Maryam Rajavi, on Saturday, April 6. Mr. David Jones, the Welsh Secretary under former Prime Minister David Cameron and Minister of State for negotiations with the European Union in current Prime Minister Theresa May’s cabinet, spoke with Mrs. Rajavi at the end of a whirlwind two-day visit to Albania in which he met with several Mujahedin-e Khalq (MEK) members. He visited the MEK’s compound, Ashraf III, outside the Albanian capital of Tirana. 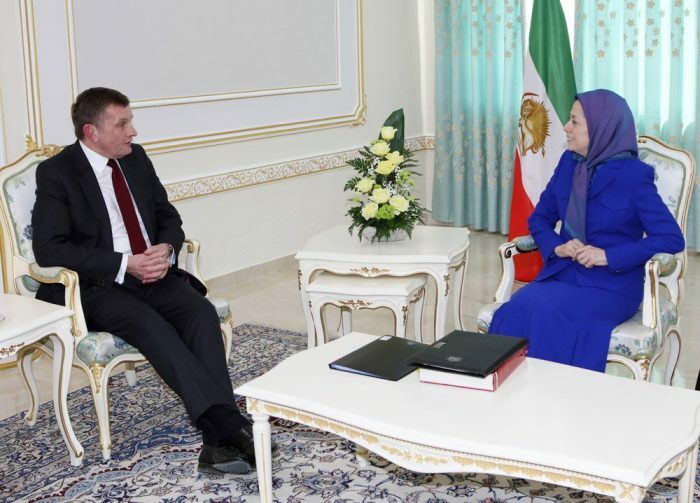 His visit comes just several weeks after his colleague, Struan Stevenson a former Scottish MEP, released a book about the compound and the Iranian regime’s attempt to demonize and destroy the MEK. Jones extended his condolences and sympathies to Mrs. Rajavi and her compatriots in Iran following the widespread flooding in recent weeks. 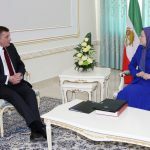 He also expressed his support for the MEK and the important work they are undertaking to oppose the regime’s brutality and violence wherever it occurs. During the meeting, Mr. Jones also expressed his delight with the US Government’s decision to include the Iranian Revolutionary Guards (IRGC) on their foreign terrorist organization blacklist. He reiterated the US State Department’s analysis that the IRGC is a terrorist entity and pose a significant threat to stability in the Middle East and beyond. David Jones called on his own government to apply pressure to the Iranian regime and hold them to account for their failure to provide aid and relief to the flood victims. He urged UK and EU politicians not to remain silent in the face of this blatant suppression of the Iranian people. She also welcomed the US government’s listing of the IRGC as a terrorist entity and reminded Mr. Jones that the MEK had been calling for the IRGC’s inclusion on the terror list. She described how the IRGC is not only involved in the regime’s export of terror but also a key component in its campaign of domestic oppression. She asserted that the US State Department should have listed the organization on its terror blacklist long ago.